Something new is always heating up in Baja. They have a growing food scene and now wine is playing an even bigger part. I had heard about Baja’s extensive wineries and had planned to check it out myself. 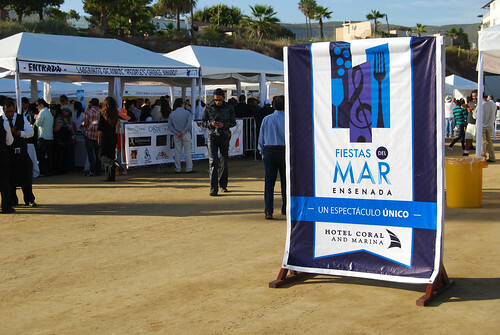 Instead of a research-based trip traveling from place to place, I was able to experience it all in one spot: at Ensenada’s premier hotel, Hotel Coral & Marina and the scenic location for the inaugural Fiestas Del Mar (or Festival of the Sea). More than 17 wineries participated during this two-day event, held April 20-21. Guests totaling 3,000 people from both sides of the border had their fill of ceviche tastings from various restaurants and blind tastings for the best wine for the People Choice Award. (The winning wines for this event were the red zinfandel from Bibayoff Winery and Cavas Valmar for the white.) A highlight of the evening for me was the The Beatles and Rolling Stones tribute band. The event concluded on Sunday with even more wine and a variety of seafood. Here’s a look at the event. Trip was courtesy of Allison PR. All opinions are my own and I was not compensated for the review.